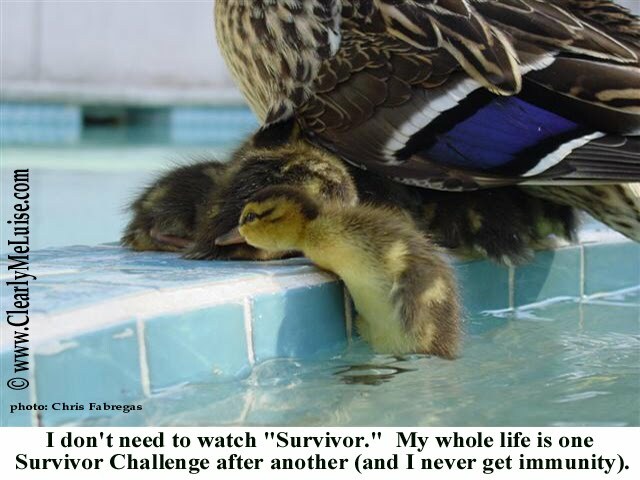 Always Amazing Animals: DUCKY HAS STOPPED WATCHING REALITY T.V. Funny and Inspirational Animal Pictures (and Comments) to Make You Smile. DUCKY HAS STOPPED WATCHING REALITY T.V. OMG! I feel the same way! You're welcome. Thanks for the comments. Great job. All are very funny. remarkable pics. Please leave a comment. We'd love to hear from you. This blog is dedicated to all the wonderful animals we know and love. Please be kind to them all. Every animal you see deserves love, respect, and good treatment. Let them into your heart and you will always be thankful you did. If you have space, time, and love in your heart - adopt a pet. WARNING! Be Informed. Protect your pets. PLANTS THAT CAN POISON YOUR PETS - KEEP AWAY! Note cards, posters, mugs. Partial proceeds go toward feeding the models, and animal causes. email: info@clearlymeluise.com for prices and all merchandise available. ADOPT A RESCUE PET - Share your loving home with a pet that needs you. Contact: The Pets do not answer their own email but they have "people" who do. ALL RIGHTS RESERVED. Please contact us if you want to use this property in any way. WAYS YOU CAN HELP ANIMALS - START HERE. WANT TO HELP ANIMALS? CLICK HERE. SEE HOW TIFFANY THE CAT SOLVES A MURDER. Amazing book by Jacque Heebner! Link to Animal Planet - so much to see, so much to love, so much to learn. Animals in photos are family members and were not harmed during filming of these pictures. In fact, they were given plenty of snacks and potty breaks, and were also provided crystal fresh water bowls, fluffy pillows, comfy laps and anything else that pleased them. The photographer, however, was scratched, pecked and fell in the pool.